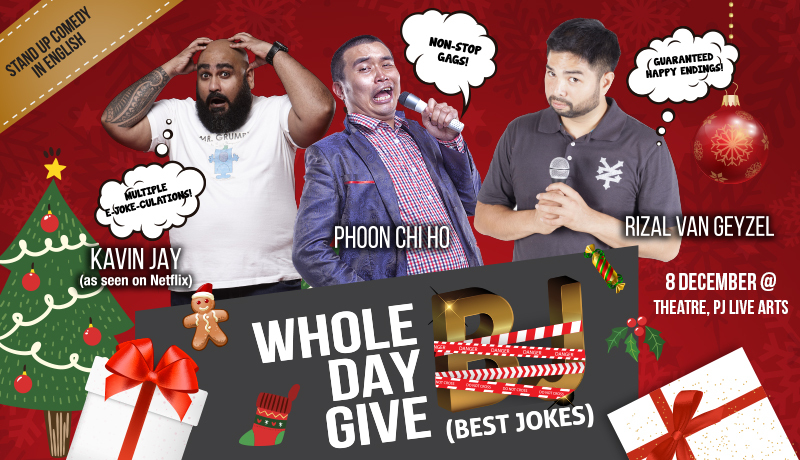 Let Kavin Jay, Phoon Chi Ho and Rizal Van Geyzel satisfy you with a whole evening of Best Jokes and Happy Endings. This trio of naughty Santas will tickle your tummy with some jingle bells, non-stop gags and multiple E-Joke-Culations! End 2018 with a BANG! Let Kavin Jay, Phoon Chi Ho and Rizal Van Geyzel satisfy you with a whole evening of Best Jokes and Happy Endings. This trio of naughty Santas will tickle your tummy with some jingle bells, non-stop gags and multiple E-Joke-Culations. Watch out for the hidden mistletoe around the theatre!